Description: This pit is great for providing light and warmth to your poolside, yard, or patio. It features elegant matte steel, making it a perfect background for any backyard. 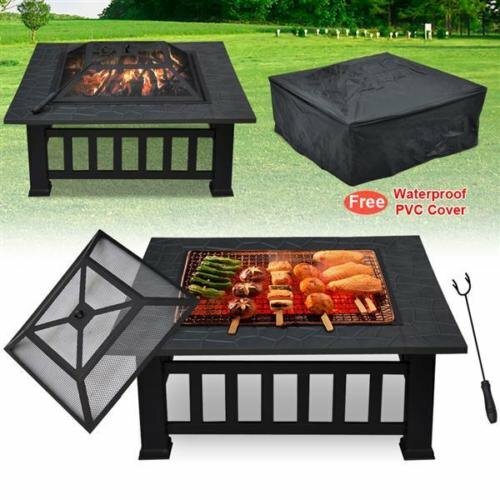 Square design and faux-design black coated finish fire pit It comes with safety mesh screen lid, safety hand tool included, and fire pit cover Heat resistant iron fire bowl Mesh screens allows you to watch the burning fire Poker tool can be used to stoke fire and remove the mesh cover Solid legs makes it steady Easy to assemble Weight: 14.9kg/32.8 lbs Overall dimensions: 81 x 81 x 40cm/32"(W) x 32"(L) x 15.7"(H) Bowl dimensions: 52 x 52 x 9cm/20.4"(W) x 20.4"(L) x 3.5"(H) Color: Black Please note: The BBQ shelf in the pictures is not included. View More In Fire Pits & Outdoor Fireplaces. If you have any questions about this product by Oregon Tools, contact us by completing and submitting the form below. If you are looking for a specif part number, please include it with your message.